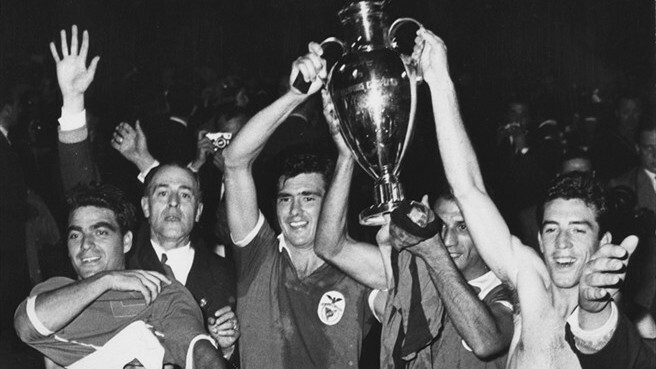 On This Day in Champions League was played the final Benfica – Barcelona. For the teams were the first final ever. The European Cup, the old name of the Champions League, was won since the first Champions League Final in 1956 by Real Madrid five straight times. In a really interesting match, the star was José Pinto de Carvalho Santos Águas. José Águas score one goal in this final and was the top-scorer of the Champions League 1961. He was a tremendous striker, scoring 290 goals in 281 Apps with Benfica. On the other side, in the Hungarian footballer era (remember Puskas in Real Madrid? ), Barcelona fight until the end and scored two goals with Sándor Kocsis and Zoltán Czibor. But the Portuguese team won this Champions League and was the first of two in a row. No glory for Barcelona, they had to wait 31 years for the Champions League, until 1992, when they won against Sampdoria 1-0 with a free kick by Koeman. [VIDEO] 23 July 1995, Uruguay vs Brazil 5-3. Uruguay won the Copa America. Next story Who is the first American to play in Serie A? Previous story Top 9 One-club players. Only one better than Totti.